Nora Abbott is looking for a peaceful reset to her crazy life. But in the mountains of Colorado, murder and conspiracy await. Nora’s new job in Colorado working for a brilliant scientist at an environmental research firm seems too good to be true. Come to find out, it is. The longer Nora works, the more convinced she becomes that something is off about the place. And she begins to find alarming clues. Suspicious accounting irregularities. A former director disappearing without a trace. Compelled to unravel the mystery and plunging headlong into mounting danger, Nora risks all to find answers, uncovering a trail of corruption and a dangerous plot to wreak unthinkable destruction. Murder mystery, redemption, Native American culture, and intrigue combine for an exciting and satisfying novel. Skies of Fire is the second of the Nora Abbott mysteries. Recommended if you like James Patterson, C.J. Box, or Mary Higgins Clark. 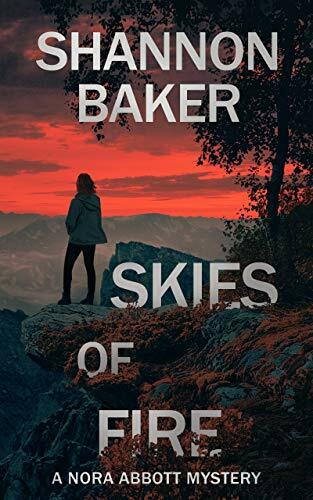 “Baker deftly escalates the stakes of her initially straightforward story, which takes a much more serious turn before arriving at its unexpected conclusion.” ―PUBLISHERS WEEKLY.